I was driving to dinner in the evening. The sun set wasn't awesome but I like the shadow of trees and buildings. This is the scene where we see the outline of a subject and sometimes it looked even nicer than seeing it in detail. This shop selling tea leaf appeared to be unchanged for many years. From the Chinese characters of the front white shelf, it seems to be doing wholesale & retail businesses. Therefore I find there is a big green weighing scale behind the white shelf and two smaller weighing scales on the counter. It makes me feel like time froozen in this shop and I am glad to see this shop still operating in good shape. Bukit Tambun Seafood Restaurant is one of the famous places for seafood in Ipoh. 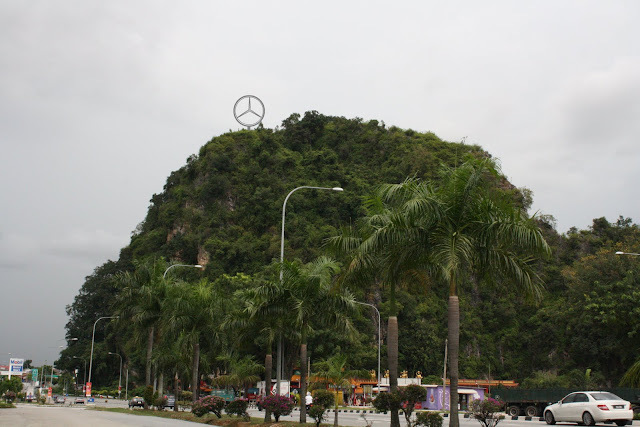 Bukit Tambun is actually a town in Seberang Perai, Penang state which is well known of its seafood. I believe the restaurant is named after this town is either the onwer originated from Bukit Tambun or to emphasis the tasty seafood is as good as in Bukit Tambun. Anyway, the food is really nice & tasty that able to attract customers around Ipoh & also from other towns. To many other cities, high rise building construction is just very common & tower cranes are normally seen here & there. As in Ipoh, high rise building is not a trend of development. We don't always see tower crane in the city. However, we have recently 5 tower cranes appear at the same time for 3 construction projects (Kinta Riverfront, MH Tower, Medical college at Greentown). I think this has not happened before as I remember the most we have is only 3 cranes at a time. This may not be a measurement on the growth of Ipoh but just to share my taughts where I believe someone may not realize. 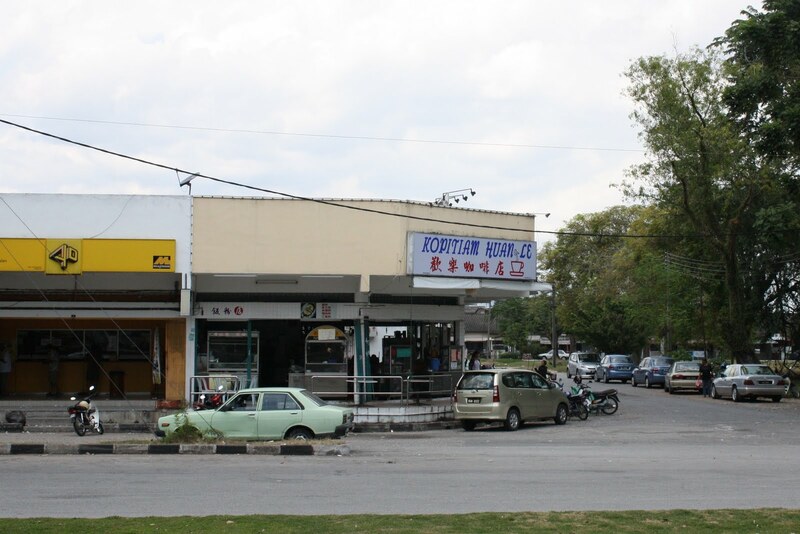 Ipoh's buildings are normally designed conservatively & simple to suit the convenience for construction. Therefore we hardly find buildings, especially those constructed in the past few decades, to be attractive and marvellous. Anyway, today I find this at a corner of Greentown, which normally doesn't catch people's eye, at the junction between Dato' Ahmad Said Road & Ashby Road (Hospital Road). This is an extended building of an existing tiles selling shop located just next to it. Although this new building is geometrically simple, but brilliant ideas have been put onto the surface finishing to make it more attractive. This may not be the best design in town but certainly a unique piece. Hopefully there will be more creative & outstanding designs appear in Ipoh. 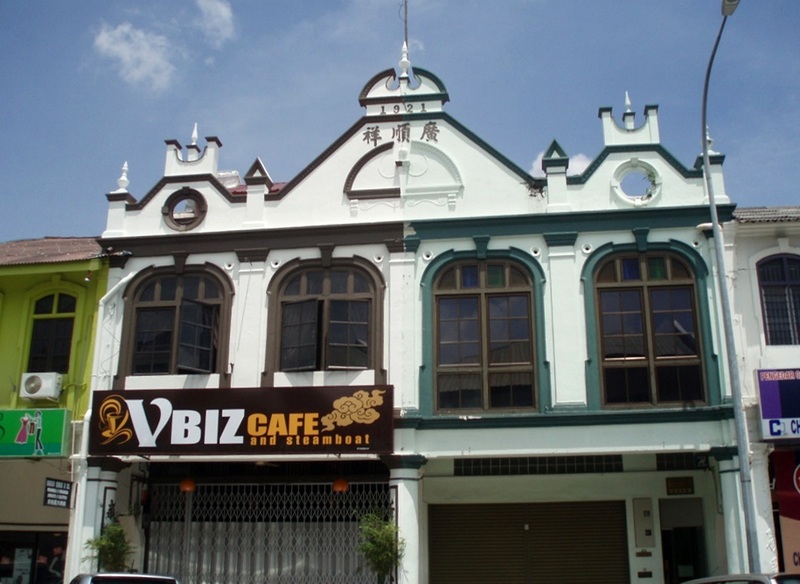 It may helps to eliminate the unseemly nickname of Ipoh called "desert of culture". Although it was not downpour that would wash away all dust & heat accumulated in those warm days, the dark clouds did bring us rain and slightly cool the atmosphere. It was a post dated 14-May-2010 showing the photo of old shops torn down at Theater Street. The construction of rebuild the building is fast and it reach the roofing stage now. Anyway, to my surprise, it remains quite similar to the original design, although not exactly but at least it is more harmony to the other shop houses at its surrounding. I check in more detail of the photo taken in 14-May, it seems like the few pillars are retained in this building. This is a good example of redeveloping old buildings in downtown. Nevertheless, to correspond the effort of heritage building preservation, it would be greater & more meaningful if the whole building is preserved (may be reinforcement is needed) instead of reconstructed. 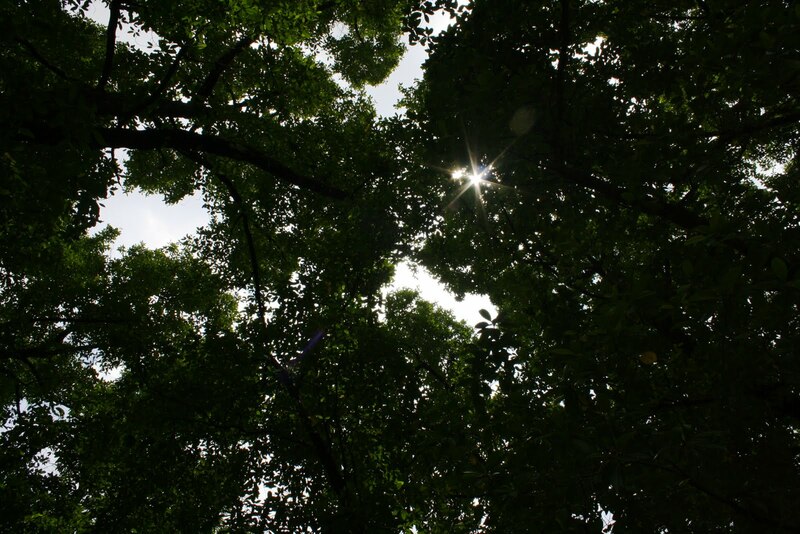 It cannot be denied that trees is the best shade to avoid from hot sun & cooling the temperature of earth. The layers of leaves are filtering or even absorbing the heat. However, we are cutting trees without proper control to give way for development. Therefore we have to suffer the climates change that brings warmer and distorted weather condition. I hope we will replant more trees & implement more green factors in all future developments. A bad habit of Malaysian is littering. When economic growth surpasses humanity advancement, we will encounter social corruptions & environmental damages. People over consuming resources & putting a large portion of it for unnecessary purposes, or in other word is just wasting. Many things, especially packaging materials, are just become rubbish after being used only once. And that's why we find so many illegal rubbish dumps appear in the city nowadays. The worst scenario is seen in this photo where rubbish dump is burning openly causing serious air pollution & releasing harmful gas to the environment. The worrying fact is not only the failure of local authorities & government to clear the rubbish, but the neglectful attitude & low awareness of people on environment & resources preservation. Although Malaysia is located near to the equator, we still observe change of season from the trajectory of sun and sun rise-sun set time. The sky is getting dark earlier than few months ago. Cars are running with lights on on their way home around 6pm~7pm. It used to be still bright sky during the off work hours somewhere in August. Although only limited sunlight remains, the clouds delays the darkness for minutes by refraction and leaves the final shining lines in the sky. The warm weather has continued for more than a week. The past sunny days have dried up the earth & plants, especially weeds. 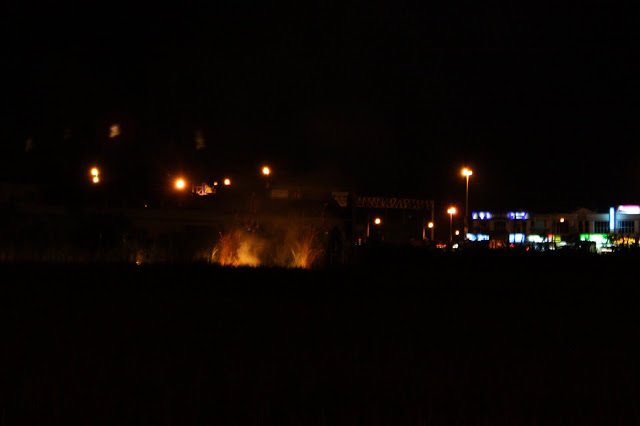 It is not surprise to see burning grass day and night at everywhere that makes the fire brigade busy. Furthermore, the extreme weather also make many people sick. Hopefully the warm days will end soon; I miss the cool and refreshing atmosphere. Town Hall is "Dewan Bandaran Ipoh"
For so many years, we used to call this heritage building in Old Town as Ipoh Town Hall but there were confusions where some call it "City Hall" which may be misunderstood as the city council. The confusion also happen in Bahasa Malaysia where some people call it "Dewan Bandaraya Ipoh", but this name, again may refers to the city council (in official, the city council is called Majlis Bandaraya Ipoh). I think the city council realizes this phenomena and it has taken some actions to put up the official name on the relevant buildings. Earlier the city council administrative center in Greentown is fixed with the wording sign "Majlis Bandaraya Ipoh" on its roof (as published in 8-March-2010). Today when I drive through Town Hall, I find it is also fixed with its official name "Dewan Bandaran Ipoh". 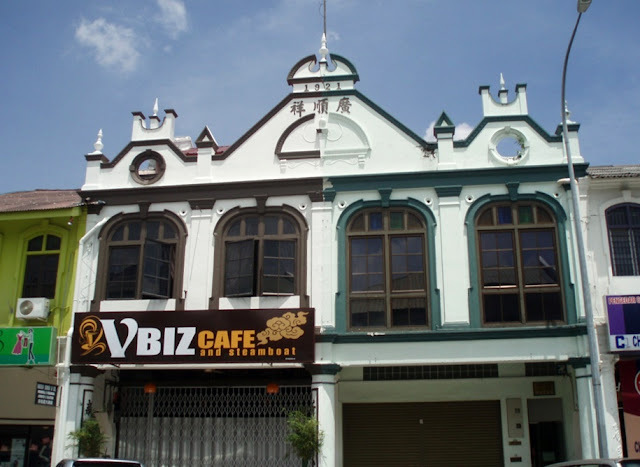 Hopefully it will eliminate the confusions & guiding Ipoh citizens to use the correct name of these buildings. This coffee shop near my house in First Garden had been operating for more than 20 years under the same owner. We have been so familiar with its coffee, tea and mixed (coffee mix with tea, called "cham" in Malaysia). It was named as First Coffee Shop (第一茶餐室). However, after so many years, the owner may feel like want to relief from the tiring job, the shop is taken over by another owner recently and renamed as Huan Le (means happy). Although most of the hawkers remain same but I still feel regret to see the name I am so familiar with no longer exist. This scene really make me think of Japan. The Japanese Garden in D.R. Park is nicely designed. It should be a join effort with Ipoh sister city, Fukuoka. I wish to share more photos of this garden in the future since I like it so much. There is another Japanese Garden near Perak Turf Club which established long time ago. I have not been there for decades. I will find a day to take a look over there and to recall my childhood memory because it was another popular public recreation park in the years of 1970's other than D.R. Park. Tow Boh Keong Temple (斗母宫) at Tokong Road (near Kampar Road) is one of the biggest Chinese temple in Ipoh. Every year in the first nine days of Lunar calender 9th month, it will have grand celebration of the birthday of Nine Emperors (九皇爷诞). 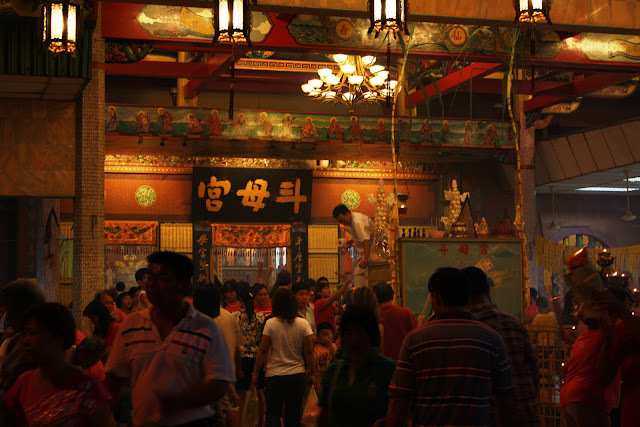 This is also a big event in some other temples in Ipoh and also other major towns in Malaysia, such as Penang. Tow Boh Keong is always the most popular among the temples and therefore it is also known as the Nine Emperors Temple. During these nine days, the temple is crowded day and night. Traffic at the surrounding area is definitely congested and there are many people selling joss stick. At the front yard, a tall post called "Sky Lamp" (天灯) with nine lamps installed is standing. As I know, this is the signal to Heaven that praying event is being carried out on earth. The lamps will be sent to ground from time to time for refilling and raised to top again. The banner is written "Blessing from Heaven" (天宫赐福). The front yard also houses a stage that performs traditional Cantonese opera which is rarely seen in Ipoh. It used to be quite common in many temples decades ago but nowadays we can only find it during some limited occasions. The seats are full and there are majority from the elder generation. Another unique thing of this event is the turtle bun. Most of it are colored in red and therefore people use to call it red turtle bun (红龟包). There are several sizes, from normal size of a bun to as big as these in this photo. Its top is always written with blessing words. I like it since I was young mainly because of its cute looking. Although it is just a plain bun but it is tasty especially when taken in hot. We have been living like in the flame for these few days. Weather change in sudden from raining everyday to not even a drop of water from the sky. The sun has continued burning the earth directly for days and the atmosphere is so warm. Anyway, this is always the time I can see beautiful sunlight refraction during sunset because of the thin clouds. Today I find this scene is like flame in the sky, which totally matching the recent weather. These are the corns I bought at Klebang on Saturday. I brought to my family yesterday to taste it and they are quite satisfy. It seems I can visit them again next season. I wonder the farm will survive for more years because the housing estate development around that area is quite aggressive and one day it may be converted into houses. Back in First Garden this evening to fetch dad for dinner. So coincidently I catch the moment of sunset that display nice coloring in the sky behind Kledang Hill. Recently when I pass by in the afternoon, I can see the sweet corn seller alongside Kuala Kangsar Road always attract drivers to stop by & buy some corns. It is just harvested from the corn field behind & must be fresh. Well, today I also manage to bring back some sweet corns. According to the farmer, it takes about two months for another harvesting cycle. So I can now estimate when they will appear here at the road side for the next season. After a sunny day, the evening skyline appeared to be quite clear except some cirrocumulus clouds. It does looked like a wide spread giant wing in the sky. Anyway, the warm weather made me feel uncomfortable especially when I am still not fully recover from fever since three days ago. The open space night market is very popular throughout Malaysia. Back in 1960's~70's, Ipoh city center used to have night market at Market Terrace near the Central Market. If not mistaken, it was the only night market in Ipoh as the population was concentrated in downtown. Furthermore, there was only few departmental stores but none modern shopping complex at that time. Therefore people like to visit night market that offers almost all kind of stuff. Few decades down the road, migration to suburban had affected the night market business. It started to follow the crowd moving to housing areas, leaving downtown quiet & lifeless. Only until few years back, the city council set up a new night market here at Osbourne Street (this street used to be very happening with many street hawkers 30~40 years ago) and name it "Gerbang Malam" (Night Gate). Although it is not as popular as the old time night market, but it certainly breaks the many year silence in Ipoh city center. Some lamps in D.R. Seenivasagam Park are using energy saving light bulb. Many public lighting facilities in the city have been using this kind of bulb. This is a good move and shall be an example for all, from individual to commercial, to practice energy saving in any possible aspect. When looking at this big mushroom cloud, for someone who plan to go out, it will be smarter to have the umbrella ready. Despite the sunny afternoon is now heating up the earth, soon the growing cloud will bring us rain, likely heavy rain, to cool it down. Well, this is not a bad idea. At least the day will become more comfortable for Friday night activities.